IPSec deals with encrypting data over the network. What IPSec does is protect data against those bad people with their protocol analysers. Encryption prevents these network monitors capturing packets and reading sensitive information inside. In my mind’s eye, using IPSec is like putting one of those clear cellophane envelopes in a sealed parcel. 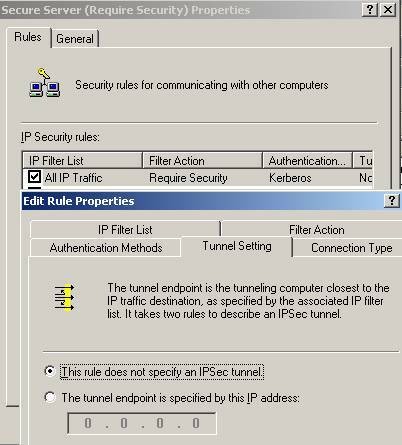 The best way to set IPSec is through Group Policies, alternatively, you can check through TCP/IP properties, Advanced. Client (Respond only) Means ‘I will speak IPSec if you wish’. Server (Request Security) Means ‘I would like to speak IPSec, but if you cannot comprehend IPSec then I will speak normally. Secure Server (Require Security) Means ‘I will only speak with clients who understand IPSec’. Transport Mode is designed to ensure that traffic between two machines is secure, for example the Financial Director and the CEO. Tunnel Mode is to secure traffic between two networks and is particularly useful for VPN traffic where you need encryption over the internet. Remembering that the whole purpose is to encrypt the data leads me to check out the encryption settings.